By Christine Schmidt @newsbyschmidt Dec. 6, 2018, 9:44 a.m.
A new report from the Reuters Institute for the Study of Journalism, three years in the making, echoes some of Pompeo’s take on digital natives’ upcoming “frigid winter,” this time for European publishers. 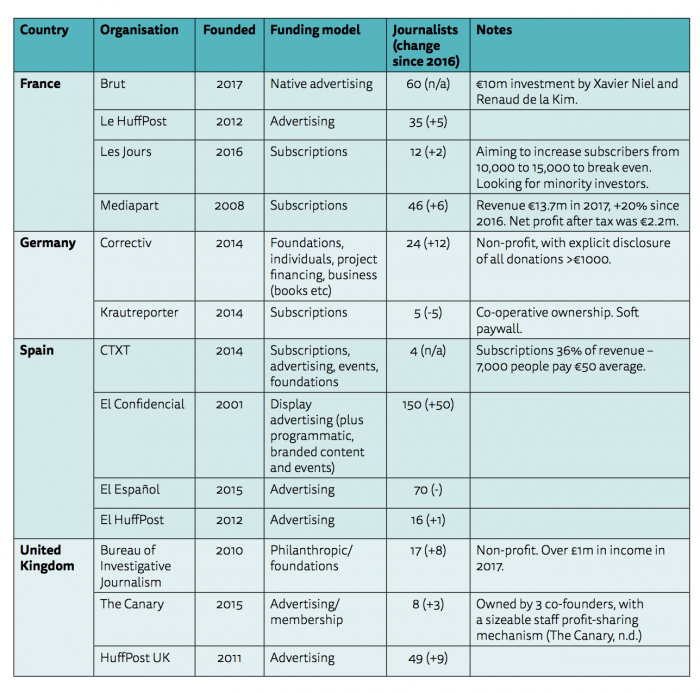 Researchers Tom Nicholls, Nabeelah Shabbir, Lucas Graves, and Rasmus Kleis Nielsen interviewed leaders from 13 digital native media outlets in France, Germany, Spain, and the United Kingdom in a repeat of their 2016 study, which suggested the European digital-born organizations were more pragmatic than innovative. The newer organizations are tending toward quality over quantity, prompted by their attempts to build a news organization worthy of paying audiences. “It’s like we’re farmers. We have to produce stuff every day, go to the marketplace every day, and attract people with good stories. So that’s not a scalable start-up business, but it’s a very steady, very sustainable, and very honest business based on relationships. And that’s a lot of fun,” said Krautreporter’s publisher, Sebastian Esser. “Every year we ask ourselves: ‘Will we grow again by 10,000 subscribers next year, and then the following year again?’ Trees do not rise to heaven,” said Mediapart’s cofounders, Edwy Plenel and Marie-Hélène Smiejan-Wanneroy. The transition of asking readers for money was a particular pain point in this report. In 2016 very few digital native news outlets were using reader revenue via subscription or membership, but six of the 13 organizations studied here are relying quite heavily on it. The publishers have also taken broad hits from Facebook’s algorithm change. The Spanish sites, in particular, have been hit hard, with El Español and El HuffPost losing 50 percent of their traffic. This French startup is betting on native social video and is now eyeing expansion to the U.S. 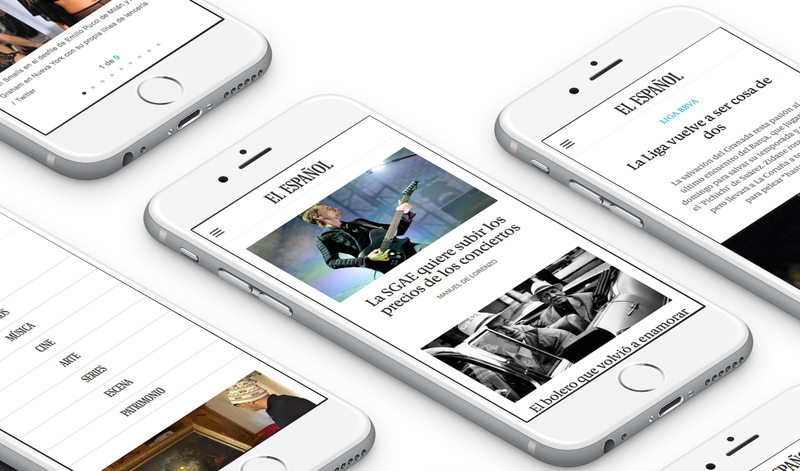 Image of El Español on mobile phones by Nacho Gómez used under a Creative Commons license. POSTED Dec. 6, 2018, 9:44 a.m.
Schmidt, Christine. "Digital-native publishers settle in to face legacy constraints, with a side of reader revenue." Nieman Journalism Lab. Nieman Foundation for Journalism at Harvard, 6 Dec. 2018. Web. 23 Apr. 2019. Schmidt, Christine. "Digital-native publishers settle in to face legacy constraints, with a side of reader revenue." Nieman Journalism Lab. Last modified December 6, 2018. Accessed April 23, 2019. https://www.niemanlab.org/2018/12/digital-native-publishers-settle-in-to-face-legacy-constraints-with-a-side-of-reader-revenue/.